From Contrarian Outlook: If you’ve filled up your car lately, I don’t have to tell you that oil prices have come back to life after years in the doldrums. So today I’m going to give you 3 terrific funds that let you take back the power. Each one pays 6.5%+ dividends and is set to pack big price gains as oil resumes its rise (and it will). It’s rare to hear the words “oil” and “6.5%+ dividends” in the same sentence. The truth is, many energy stocks don’t give investors an income stream, while a lot of energy funds are fundamentally flawed. For example, in the last three months, the WTI crude-oil spot price has risen 6.1%, but the oil ETF United States Oil (USO) is up just 4%. Oh, and it pays zilch in dividends. Which is where the energy funds I’ll show you today come in. Each is well managed and throwing off dividends from 6.5% to nearly 10%. That’s right. We’re talking a massive income stream, along with fast (and lower-risk) price upside. Plus, these funds are managed by energy experts–and you need experts in the ever-changing world of commodity investing. What’s more, all 3 of these funds are diversified across hundreds of companies exposed to energy markets around the world. That gives you some nice downside protection if one (or more) of these firms hits a rough patch. And there’s one other great thing: all 3 of these funds trade cheaper than they’re really worth. That’s because they are all closed-end funds (CEFs), a special kind of fund whose market price varies from its net asset value (NAV), or what its portfolio would be worth if it were sold off today. And these 3 CEFs all trade at big discounts to NAV, letting you buy a slew of high-quality assets for much less than you’d pay if you bought each one individually! 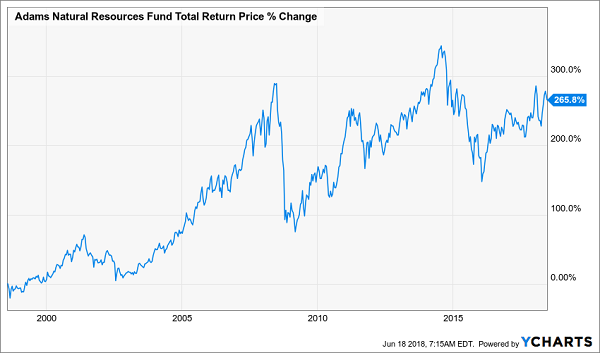 Let’s start with the “modest-yielding” Adams Natural Resources Fund (PEO), a CEF that boasts a 6.5% dividend and is run by one of the oldest CEF managers in the world. Adams traces its history back to the 19th century, but PEO goes back “only” to the 1990s, which still makes it one of the oldest CEFs going. And over that time, PEO has given investors a solid return–it’s up a nice 265.8% (dividends included) since launch. With a discount at its lowest point in years, PEO is now an incredible value, especially with oil prices moving up as they are–and setting PEO up for further gains. Of all the energy CEFs out there, only 30% have had a long-term positive return over the last decade, and that’s all because of oil’s collapse in recent years. And the Tortoise Power & Energy Infrastructure Fund (TPZ) would certainly be one of these top performers–if it were just one year older. TPZ’s diversification among oil producers, transporters and other firms in the supply chain is the key to its outperformance, and it’s also why TPZ is well positioned to benefit from a stronger economy, where oil demand is increasing and people are more willing to pay higher prices for energy. 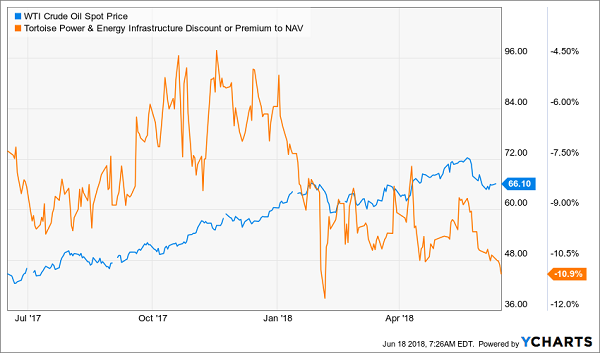 These strengths are also helping TPZ sustain its 7.1% dividend stream, yet the fund is trading at a 9.5% discount to its NAV. Such a low-cost income stream is rare, yet that discount has gotten bigger in recent months, despite oil’s strength. And that’s why now is the time to strike. 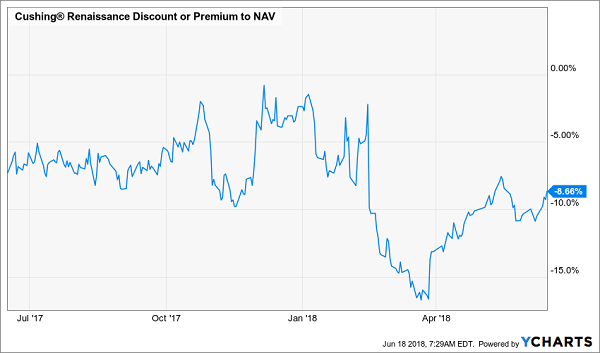 If you’re a high-yield fan, you’re going to love the Cushing Renaissance Fund (SZC), with its 11% discount to NAV and massive 9.9% dividend yield. 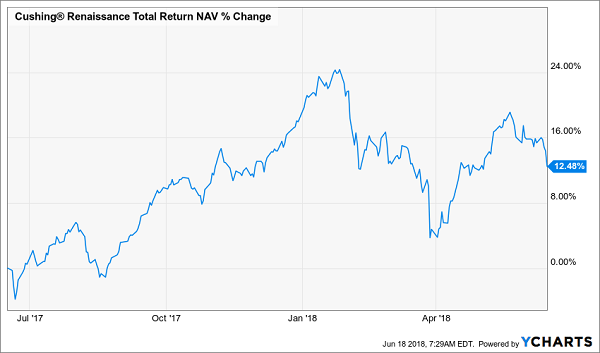 And because that yield is calculated on the fund’s market price, and that price is lower than its NAV, SZC only needs to get an 8.8% return in the market to fund its payouts. And, of course, with oil getting more expensive, that return is getting easier to achieve. 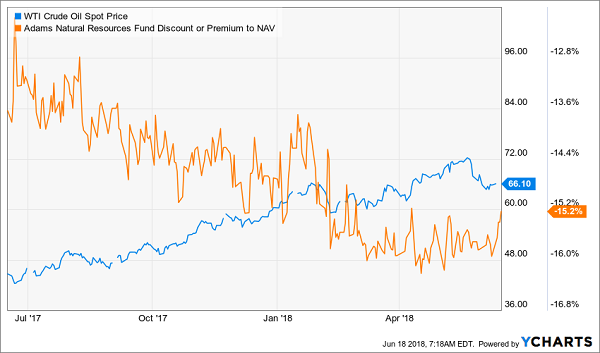 Notice, though, that the silliest depths of SZC’s discount, at over 15%, are behind it, and the fund’s discount has been rapidly disappearing in recent months. 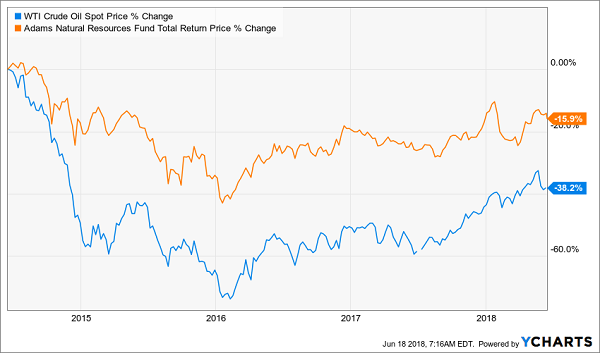 The market has woken up to this fund’s low price and strong performance, so investors are buying in, both for the capital gains and that nice 9.9% income stream. And since oil keeps rising with a growing economy, which, of course, has growing energy demand, SZC can continue its strong performance. That will entice more investors to come in, which will drive that discount shut. If you beat them to the punch, though, your gains will be that much greater. So what are we really getting here? 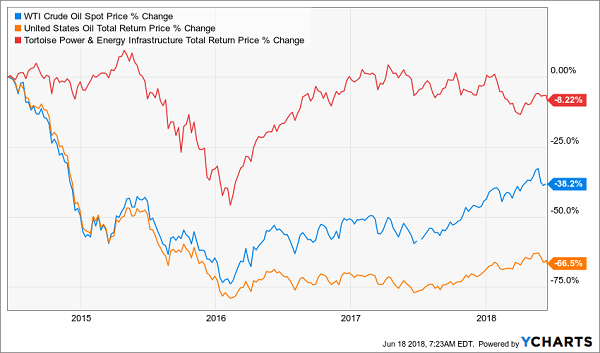 A chance to jump on rising oil prices, but with a safety net almost no other energy investor can match, thanks to the massive diversification within these 3 funds, which hold everything from drillers to pipelines. Best of all, we’re getting a big chunk of our energy gains in cash–and in my book, that beats “here today, gone tomorrow” paper gains any day of the week, especially if you’ve got retirement on your mind. If you want to take a step beyond energy and grab even more of your gains in cold, hard cash, I’ve got the perfect solution for you–5 other CEFs throwing off SAFE dividends of 8.2%, on average. And that’s just the average. Two of these ignored funds deliver 9% and 10% payouts as I write. Think about that for a moment. Split $100k up among these 5 cash machines and $8,200 of your investment boomerangs straight back to you–in cash–by the end of the first year in dividends alone. In 12 years, you’ll have pulled in the entire value of your upfront buy. Just in dividends. But of course, dividends are only part of the profit story here. Because each of these funds is trading at a totally unprecedented discount to NAV, and that simply can’t last. When these weird markdowns return to normal (which I see happening in the next 12 months, max), they’ll propel us to easy 20% price upside. So going back to your $100k example, you’d bag a nice $20,000 in gains by this time next year–on top of that massive 8.2% dividend! This is the profit-making power CEFs pack, and it’s a shame more folks don’t take advantage of these incredible funds. But that’s a plus for you and me, because CEFs’ off-the-radar nature is what’s fueling our buying opportunity. I’m ready to show you my top 5 CEF picks for 8.2% cash payouts and fast 20% price gains now. Simply click here and you’ll get immediate access, including names, tickers and my complete research on each of these 5 funds. In other words, everything you need to know before you buy. But you need to make your move soon, while these 5 funds are still cheap. Don’t miss out. Click here to get all the details now! The SPDR S&P Oil & Gas Explore & Prod. ETF (XOP) rose $0.09 (+0.21%) in premarket trading Monday. Year-to-date, XOP has gained 14.77%, versus a 3.37% rise in the benchmark S&P 500 index during the same period. XOP currently has an ETF Daily News SMART Grade of B (Buy), and is ranked #12 of 37 ETFs in the Energy Equities ETFs category.